At the start of this week Foursquare, the location based social service, celebrated a big achievement. It celebrated the 100 millionth check in. And it seems now that to celebrate the feat, it has updates its Foursquare app for iOS 4 with features that will keep you more attracted towards the service. The eye catching update is the ability to SMS and email your Foursquare friends, without leaving the app. You just have to tap on the name of a friend and a pop up comes asking which type of message you want to send. Neat ! The obvious high resolution of Retina display. Faster background refresh for iOS 4. Current position locator for all maps. All Foursquare:// urls now open without crashing in other apps, when Foursquare is running in background. 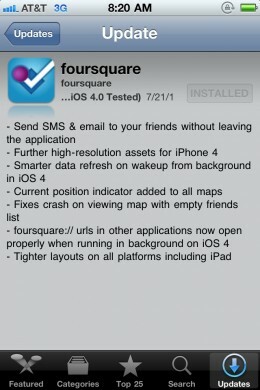 You can grab the iPad/iPhone app for Foursquare for free from here.